Abstract: With the recent release of the 533 MHz based Pentium 4's obviously comes a whole slew of new chipsets to support the new bus speeds as well. With the recent release of the 533 MHz based Pentium 4's obviously comes a whole slew of new chipsets to support the new bus speeds as well. The "new" i845E is basically the i845D that officially supports 133 MHz FSB and nothing else. Actually almost all i845D based boards could hit 133 MHz+ FSB's no problem and in fact if you search MadOnion's database you'll see several hundred i845D systems that are at 133 MHz FSB or well over! 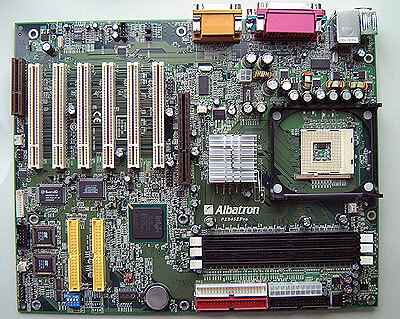 The P4X845EPro is one of the most feature rich motherboards out there, Albatron threw in everything but the kitchen sink with this motherboard. There's one 4x AGP (with 1.5V lock), six 32-bit PCI slots onboard Ultra/133 IDE RAID, 5.1 audio, 10/100 LAN, three DIMM slots, four USB 2.0 and a CNR for good measure. Next thing to do is give their motherboards a pretty coloured PCB and they'd be set! Albatron, originally known as Chun Yun Electronics was founded back in the early 80's and has been mainly producing CRT monitors and televisions. Last year they decided to change the company's direction and try their hand in the highly lucrative, highly competitive market of computer components and peripherals. With very little prior experience in this new market they needed a leader, one that would immediately earn the respect and that's where Jack Ko (Big Jack) comes in. Jack Ko former CEO of GigaByte retired at the age of 40 in the middle of 2001, confident he was leaving a company (that he helped started) with a bright future. After about three months of golf and spending time with the family, the events of Sept. 11th 2001 made him think about his life and how things can suddenly change. Feeling those old fires burning in his belly, there was a fluke meeting between him and the owner of Chun Yun. They discussed several things but mainly the future of IT. Big Jack was so impressed by what Chun Yun had to offer that he decided to come out of retirement and lead them into the future. Confident he could do it again, the newly renamed Albatron didn't try their hand with smaller more specific markets. Rather they have big ambitions and are going to directly compete with the "big boys" that being Asus, MSI, ECS and even GigaByte. Albatron made its official product debuts this year at Computex and things look very bright for them. We really like the layout of the P4X845EPro motherboard, it seems that Albatron put a lot of thought into it when they were designing the motherboard. It was nice to see that the main IDE, floppy drive and ATX power connector were all in a good location. Being to the right of the DIMM slots means that cables (IDE/Floppy) will not interfere with anything. Yes the ATX12V connector is on the other side of the motherboard but since it's so small it doesn't really get in the way of anything. There isn't much extra you need to buy for this motherboard with all the intergrated devices already Ultra/133 IDE RAID, 10/100 LAN and four USB 2.0 what more do you need? Yes there also is onboard 5.1 audio which uses VIA's AC'97 codec but that's only good, if you're using it to listen to MP3's or maybe watch DVD's. For audiophiles or gamers you're definitely going to want to buy a hardware based sound card. Never fear though, six PCI slots means you'll have an easy time to upgrade anything! At first glace, the Super I/O chipset looks pretty cool, but upone closer inspection it's just a renamed Winbond hardware monitoring chipset. Three fan headers is pretty standard on motherboards these days and it was nice to see that they were easily accessible, not hidden under some PCI slot or something. The P4X845Pro also has a dual bios setup so you're never going kill your board with a bad bios flash or a virus. This isn't very surprising since the current CEO of Albatron (Jack Ko) is the former CEO of Gigabyte.